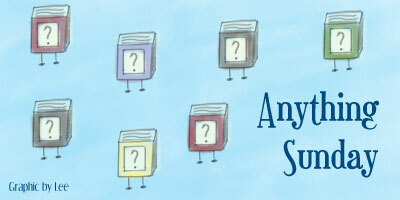 Rally the Readers: Anything Sunday (3): Pen and Paper Rock! You have no idea how much I wanted to make a rock, paper, scissors joke out of the post title. I thought better of it, however, and spared you all from the wrath of my horrible humor. This past Friday was National Handwriting Day, which I think is really neat. I still love writing with good old-fashioned pen and paper. There's just something gratifying about writing things out by hand that can't be replaced by typing on a keyboard, at least for me. Even back in school, penmanship lessons were never tedious. Most of the time, I hand write blog posts first. It started back when I sometimes picked up Ally and Melissa from school or band practice. For those of you who've experienced the (non) joy of waiting in the student car rider line, you're familiar with having time to kill. Lots of time to kill. So I'd whip out a notebook and pencil and work on writing reviews and other posts in the car until the line began moving. And I'm really glad that I did. Writing everything down first does create double work of sorts, in that I still have to type a post up. That doesn't bother me, though, and I get a much needed break from staring at the screen of an electronic device. I would miss writing everything by hand first, too, because it's become an integral part of my blogging routine. In addition to my notebook of blog posts, I keep a separate notebook of my favorite book quotes. I know a lot of other bloggers do as well. For me, a quote book is like a scrapbook; it reminds me of the books I've read, the awesome characters I've met, and the fantastic fictional worlds I've visited. As much as I enjoy putting pen/pencil to paper, something that I've never been very good at is keeping a journal. I've started and stopped a number of times through the years and have failed at maintaining a journal on a consistent basis. Often I'd sit down to write . . . and find I had nothing to say. I know the point of journals is to be able to write about whatever you feel like writing about, but I guess I fare better with structure, like when I set out to write a book review. I think I'd like to give journaling another go in the future, this time without putting so much pressure on myself to make it perfect. I feel especially old school with hand writing because I write in cursive/script almost exclusively. Scripting has always just been a lot faster for me than printing, plus I've always found script cool. When I was a kid and could just about manage printing my name, I begged my mom to teach me how to write in script like she did because I thought script looked way better than print. When I started third grade and we were expected to use cursive all the time, well, I couldn't have been happier! Are any of you old school pen and paper peeps like me? 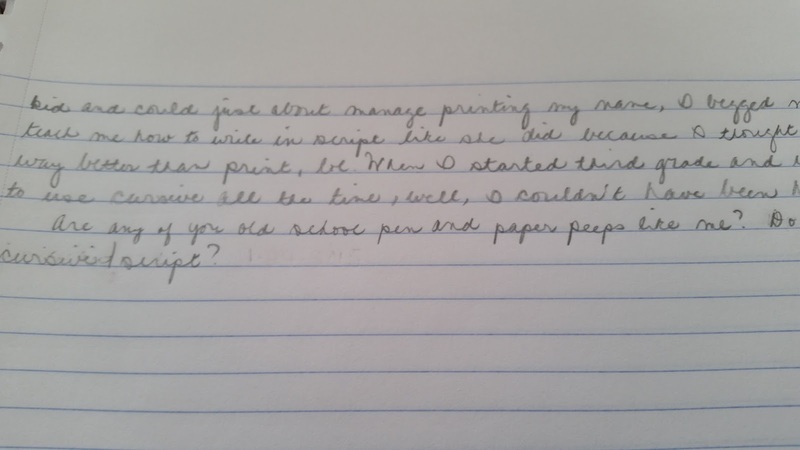 Do you ever use cursive/script? I love pretty journals, too, and I've built up a bit of a collection of blank ones, lol. Even though I try to write things out by hand regularly, I still do considerably less hand writing than I used to, and my hand also cramps up faster than it once did. If I had to do extensive hand writing for a long period of time, I'm sure my hand couldn't cope with it! LOL I totally thought of Rock Paper Scissors too and now I wish you'd told your joke XD Anyway, interesting discussion topic! I've always found it somewhat therapeutic to write the 'old fashioned way' too - but I've never liked my handwriting much, which is problematic >.< I used to keep a journal but I've fallen out of the habit...maybe it was all those years of handwriting notes in Uni that put me off, but I'm not sure. I do adore journals though ♥ I got a gorgeous one for my mom this Christmas that looked like an old Harry Potter book and I was sorely tempted to pick myself up a copy too! 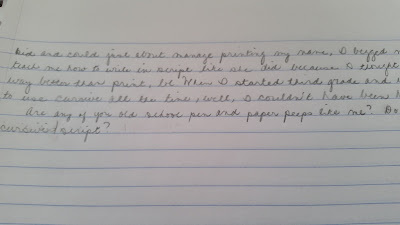 Oh and as for my writing style, it's like a mix of cursive and print, that I can't even begin to explain. It's just the way I've come to write the fastest I suppose. I think your handwriting is prettiful! ❤ I had a Harry Potter journal ages ago- I'm not sure what happened to it. I'm thinking it's one of those things that got lost in the shuffle during packing/moving. :/ I took all hand written notes in college, too; I remember getting really bad cramps in my hand during midterm and final exams because you typically had to write an essay. I don't miss that at all, lol.